What VMS systems do integrators really like the best? Over the last month, we ran an in depth survey gathering results from over 80 integrators across 19 countries to understand what technologies, approaches and products they preferred. As part of the survey, integrators explained why they preferred what they did. In this report, we share our findings for VMS systems. We left it open ended so that integrators could propose whatever they liked and not be constrained to a predefined or preferred list. We also gave them space to explain their choices. Of the 80+ total responses, integrators recommended 22 unique VMS manufacturers and provided more than a dozen pages of written explanation behind their choices. Overall: This view tracks all recommendations from all countries and integrator types. US Only: This view limits recommendations to the 65% of respondents from the US to ascertain if US VMS choices different from international ones. Small Camera Count: This view limits recommendations to integrators that typically deploy 16 cameras or less to see how this impacts VMS preferences. Mid Scale Camera Count: This view limits recommendations to integrators that typically deploy 17 - 32 cameras or less how that impacts VMS preferences. Large Scale Camera Count: This view limits recommendations to integrators that typically deploy 33 or more cameras and how that impacts VMS preferences. 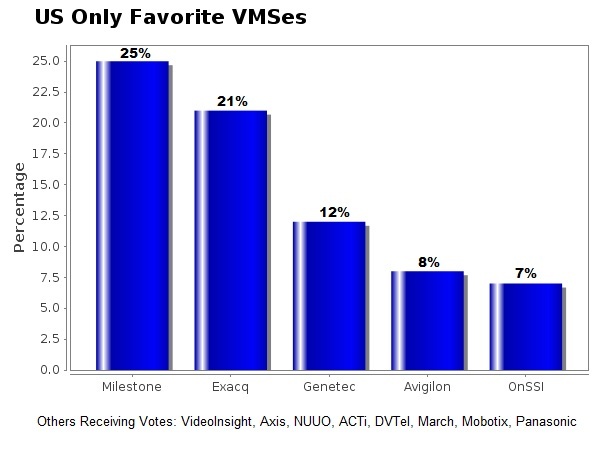 4 VMS manufacturers stood out to be integrator favorites: Milestone, Exacq, Genetec and Avigilon. 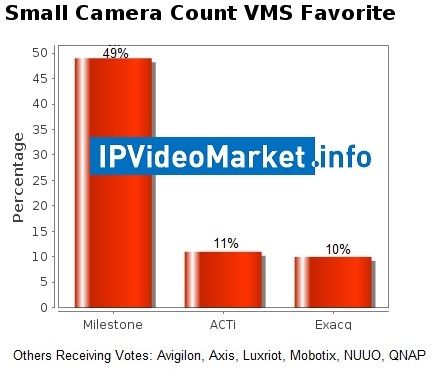 Milestone and Genetec are likely to be no surprise to industry observers but Exacq and Avigilon might. That noted, these were the 4 manufacturers we recommended in the October Buyer's Guide as being the top 4 VMS safe choices. Milestone received the most favorite recommendations overall and, in a landslide, the most favorite votes in the small scale category. However, Milestone only came in 3rd place amongst large scale integrators. Exacq finished a surprising yet distance 2nd overall, and a very close 2nd in the US category. 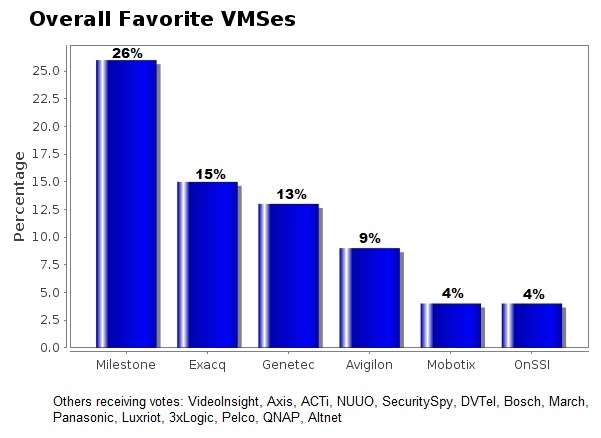 Exacq also narrowly came in as the top most favorite rated VMS in the mid scale category. Genetec dominated the large scale category yet received no integrator recommendations for integrators in the small scale category. 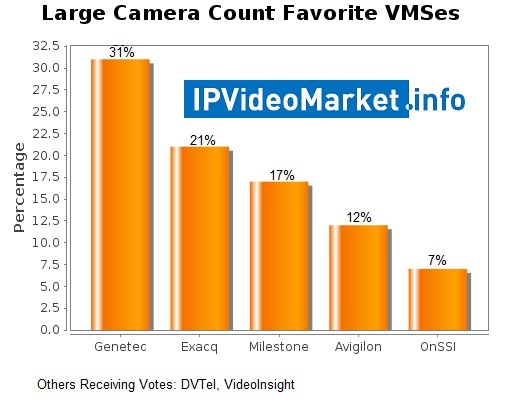 Avigilon, best known for its IP cameras, came in 4th overall as well as the US. Milestone, clearly receives the most recommendations with Exacq, Genetec and Avigilon in a distinct lower grouping. Note that many VMS companies received recommendations, typically though only 1 or 2 each. While Milestone, Exacq and Avigilon's percentages remained similar, Exacq jumped from 15% to 21% as basically all the integrators recommending Exacq were from the US. As Exacq has only recently started to expand internationally, this bodes well for them. Also, notice that OnSSI cracks the top 5 in the US only segmentation. That noted, OnSSI is far less favored by the integrators survey than the sales rankings they claim. Here, Milestone absolutely dominated. It makes sense as no one has done more over the last 2 years to make themselves attractive to small scale of the market (free VMS, $49 VMS, $99 VMS, etc.). Also, important to note Genetec received no votes. This raises an important debate/discussion - How important is the segment of the market? Is a strong sign that Milestone dominated here or is it irrelevant that Genetec did so poorly? More discussion below. Here Exacq and Milestone were neck and neck with a number of providers also receiving substantial support. Note, Genetec only received a single vote in this segment. Now, the results change sharply. Genetec has a commanding lead in this category after receiving almost no support in the previous two segments. By contrast, Milestone, coming in third, turns in its worst performance of the three segments. "Easy to use, configure, support everything"
"Good pricing, good support, does most things and looks good. Seems very flexible with options from basic upwards." "Very broad product support, low-end pricing options." "Quality software and excellent support"
"Friendly support and lot of info to download in their web page"
"Large number of devices supported. Easy deployment. It works"
"There are a lot of different packages (basic, essential, professional, enterprise and the free version milestone Go)"
"Our technicians don't have to work with several systems which means we don't have to educate them on many systems." "Lower end offerings (Essential/Express) have a good feature set at an acceptable price point." "Milestone has a significant interoperability advantage and system stability. The technical support is good and peripheral partner systems have good development support." The breadth of product offerings and the strength of support were the two most commonly cited reasons. One interesting question is how that breadth translates into success in large scale projects where, despite the breadth, Milestone lacked among the integrator respondents. "It is easy to setup, is reasonably priced, and easy to use. They also have a full line of hybrid machines which makes the transition smooth to IP." "Most of the requirements of most of our customers can be met by this product. It is very straighforward in planning and implementation and does not cause the customer to pay more for supporting infrastructure than is reasonable." "Flexibility of their software and hardware configurations." "It is simple and easy to use and we've had very limited software problems. Buying the hardware from them is a definite plus as well. It's at a good price point as well and their updates are fairly regular." "Their pricing model is simple. Their price point is good. The product works very well and we hardly have any problems. It can scale from a single camera up to 100's of cameras on the same platform." "It is extremely easy to use; it is cost effective; the management is great to work with; and the product meets 90% of the market needs." "Easy to use, Great support, Price, NVR and Hybrid Options, No need for encoders, reliable"
The two big themes we saw from the integrator's response was 'easy' and hardware/software options. It's indeed one of the reasons we test with it - simple and quick to setup and use. We also believe this is a big reason why integrators in the mid market choose it. The other interesting point is the hardware / appliance option. While anyone can pre-load Windows based VMS software on a PC, Exacq has a clear cost and performance advantage with its rare support for Linux / embedded appliances. "Support lots a Cameras Manufacturer. SDK for integration is solid and contains the feature we need. Excellent support center"
"Most dependable in reference to Camera API integration, User interface, system configuration and disaster recovery." "The platform has lots of flexibility for configuration, integration, analytics and LPR. The dealer channel is protected and maintained"
"Reliable product for our company. We can actually install it, configure it for the customer and walk away without having a dozen call-backs for Hotfix applications." "It is a very advanced and featured product, very stable and very well supported." Genetec integrators talk about robustness, dependability, stability and reliability - crucial features for large scale, complex deployments where Genetec gains the most support from integrators in the survey. As we examined in our recent critique on their competitiveness, the real question is what they choose (or not) to do about the mid market. "Avigilon offers a tremendous range of hardware and software options, very reliable performance, exceptionally priced"
"It has been rock solid and easy to deploy. It may not have the "eye candy" that others have but the software developers have made the application to operate very reliably. They also made it end-user friendly meaning it is easy for the client to retrieve and record video without calling us every time." "Clients love it. It's easy to use and learn, but still gives them better evidence than they have had in the past. Usually, they expect that "ease of use" = "lacking desirable features"." "Easy of use, great support, plug and play with their cameras, speed of searching video, one click upgrades for the system ( server, client, cameras and encoders), streams HD/MP video remotely very well, customers love it"
The combination of ease of use and advanced features stand our for Avigilon. While all the press goes to Avigilon's cameras, Avigilon's VMS is the real deal. We find it competitive in its own right, regardless of JPEG2000 or using Avigilon's own cameras. If you have not tried it out, review our Avigilon VMS test results. This is highly atypical as usually camera manufacturers make mediocre (e.g., Axis by design) or terrible VMS software (e.g., Mobotix by arrogance). We are happy to address and expand on any other manufacturer or issues in the comments. Feel free to ask questions or debate the topics presented.